In this first in-depth portrait of ultra-Orthodox Jews in Israel today, Samuel Heilman introduces a community that to many may seem to be the very embodiment of the Jewish past. To outsiders who stumble upon these neighborhoods and find bearded men in caftans, children with earlocks, and women in long dresses, black kerchiefs and stockings, it may appear that these people still hold fast to every tradition while turning their backs to the contemporary world. But rather than being a relic from the past, ultra-Orthodox Jews, or haredim, are very much part of the contemporary landscape and are playing an increasingly prominent role in the Jewish world and in Israeli politics. Defenders of the Faith takes us inside the world of this contemporary fundamentalist community, its lifestyle and mores, including education, religious practices and beliefs, sexual ethics, and marriage. 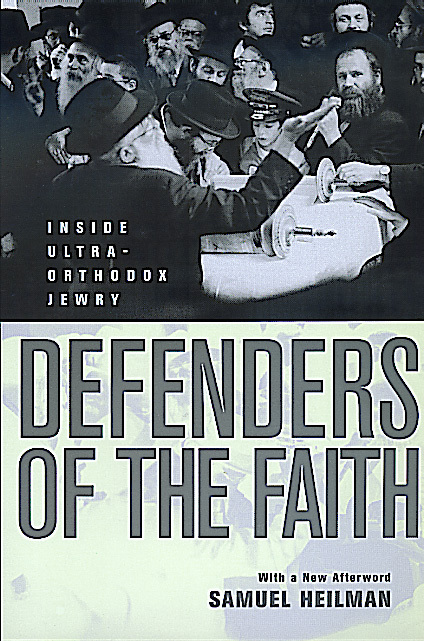 Heilman explores the reasons why this group is more militant and extreme than its pre-Holocaust brethren, and provides insight into the worldview of this small but influential sector of modern Jewry. Samuel Heilman holds the Harold M. Proshansky Chair in Jewish Studies and Sociology at Queens College, City University of New York. He is the author of Synagogue Life (1976), The Gate Behind the Wall (1984), A Walker in Jerusalem (1986), Cosmopolitans and Parochials (1989), The People of the Book (1993), and Portrait of American Jews (1995).